‘Don’t know what you’ve got till it’s gone.’ Those were the words of a rock ballad sung by an obscure eighties rock band called ‘Cinderella.’ All the lyrics say, albeit with profound truism, is that we all rather tend to take the things – or people – that are with us so for granted until they go away. So, alright! Maybe this is way too philosophical even for me, especially as all I want to say is that I had to go without water and power for a mere nine hours today. The power cut I knew about; and all credit to Batelec for having that white vehicle prowling the roads with its pakakak announcing to all and sundry na wala pô tayong kuryente sa May 10, Thursday pô ‘yun! But the announcement was for an 8-5 power interruption; so why was there no water flowing from the faucet as early as 6:30 in the morning? And not that there is even a direct correlation because, where I live, not having power does not necessarily mean not having water. I immediately suspected that that wretched backhoe had something to do about it. 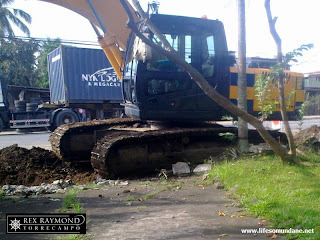 The road widening project of the DPWH finally arrived in the neighbourhood last week and for half a morning last Friday, I had no water either. A neighbour warned the project engineer the night before that the digging had to be careful about snapping water district pipes; but between the engineer and the backhoe operator, something got lost in translation. Those of you who see the backhoe digging along the roads but have never really paused to investigate, you have no idea how unbelievably deep into the earth it digs to install the concrete culverts. Let us just say that as it digs, the backhoe is no great respecter of water pipes. A good thing that another neighbour had really good abilidad. Since the water district people were MIA, he grabbed a couple of hoses, reconnected us to the source pipes with some inspired patamâ and voila! We had water! Today was different. We suspected that the backhoe had something to do with the faucets going dry; but could not immediately confirm this because the digging was about a couple of hundred metres away. Soon, though, the construction workers started trickling in for some much-needed usisâ. 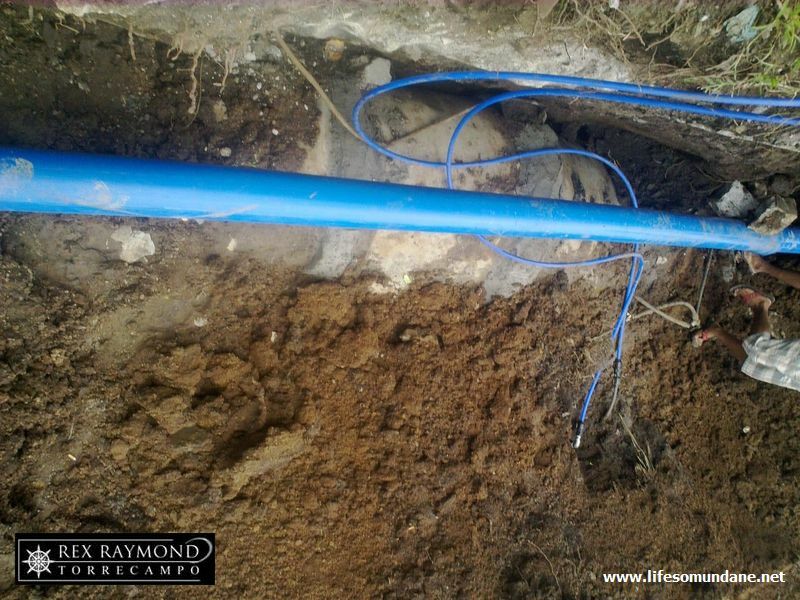 Later in the day, one confirmed that a pipe was indeed snapped last night where the digging was particularly deep. A day without power is bearable; but without water in 30+ degrees Celsius is a different thing altogether! And since there seemed no guarantee that the pipes could be reconnected, I dared not touch the little stock of water that I had. I even drank sparingly. My greatest fear was if the absence of water continued on into the next day or – God forbid – days. The drinking water should be the least of the problems since bottles of it are readily available in the supermarkets. The real problems would be taking baths, naturally exacerbated because of the summer heat; and of course the toilets. In the old days, when we used to have a tunggâ-tunggâ pump in the backyard, it would not have caused panic even if there was an unexpected problem with the water supply. Water. When I was a small boy growing up in the Base, I used to place water in the same category that I placed air, i.e. free. It was always there; it never stopped flowing; and all I needed to do to get some was to turn on the faucet. I never would have guessed that it would one day be sold in plastic bottles. I never would have imagined that the day would come when I would ever have to stock it up in large pails. I never would have thought that one day there would be insufficient pressure to send it all the way up to the shower head. In fact, I could not even imagine a day without it. There is something almost prehistoric about smelling yourself when you are sweating profusely and unable to take a bath. The thing about living in modernity is that we get so accustomed to little things that, when they go suddenly go away for one reason or the other, you are engulfed by a sense of dread and helplessness. The Java Man would not have minded a day without water at all.